A premixed blend of Bentonite Clay & Organic Powdered Green Tea, Rose & Calendula Herbs, designed to cleanse and detoxify your skin. Imparting soothing, healing, anti-inflammatory, antioxidant & toning effects to your skin. Read directions below…. Directions: Blend the mix with your favourite medium i.e. water, coconut oil, argan oil, honey, yogurt, mashed cucumber or avocado till a paste, then apply to your skin, leave until dry 15 - 30 minutes (can keep moist with a water mist sprayer if dries too quickly) and rinse off with tepid (warm) water to reveal healthy, glowing skin underneath. Tone & moisturise afterwards if needed. Recommended use 1-2 times per week. Superfine Bentonite Clay, Organic Powdered Gunpowder Green Tea, Organic Powdered Rose Petals & Organic Powdered Calendula Flowers. 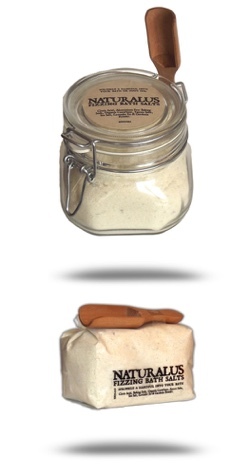 Available in 120 ml glass jars with twist top. 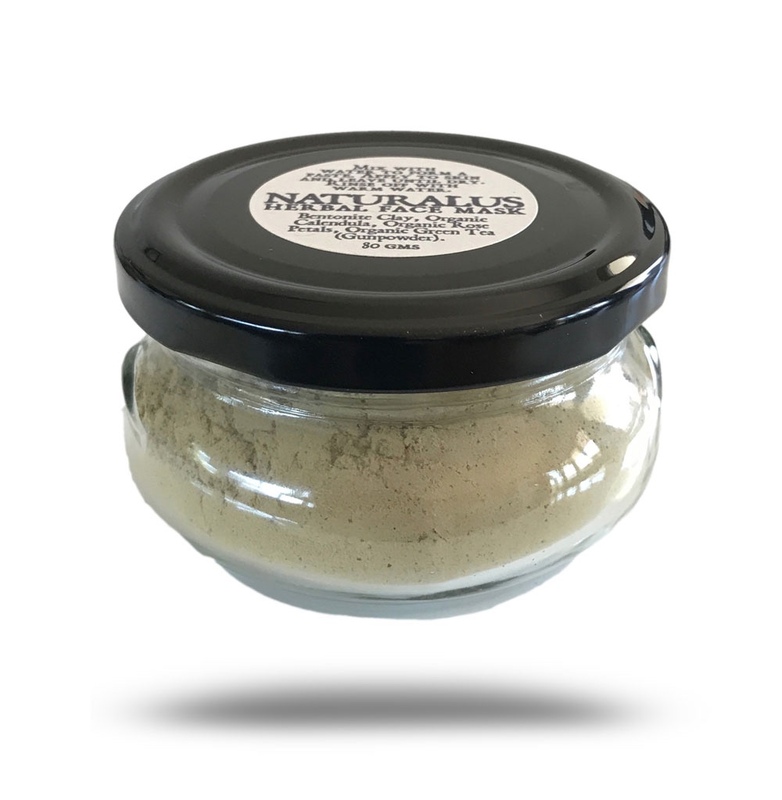 400 gms of Naturalus Relaxing Bath Salts plus free bamboo scoop (while stocks last). Designed to help relax aching muscles & joints, cleanse and soothe the skin, leaving silky smooth, as well as relieve stress, soothe irritated skin, and bring a feeling of wellness. Especially good for improving sleep, relieving tension, infection and overall aches & pains. To use, just scatter a good handful into a ready bath just before hopping in. Baking Soda, Citric Acid, Cornflour, Epsom Salts, Lavender E.O., Gardenia Blue Powder & Organic Sea Salt. Available in frosted tin-tie bag and 500 ml Fido Jar. Tooth powders are the original bases for what became toothpaste. Tooth powders have been around for a very long time. The Ancient Egyptians used as did Ancient Asian cultures. Europeans used toothbrushes without toothpaste or powder just the bare bristles until the 1800's with tooth powders becoming popular. Tooth powders are the original bases for what became toothpaste. A gentle abrasive suitable for the most sensitive of teeth. Helping to remove stubborn plaque deposits as well as supplying minerals that help to strengthen tooth enamel. When moved across the tooth surface, the tiny ridges on the kaolin particles work together like miniature files to produce a microsmooth surface on the teeth, with maximum gloss and luster. As well as make your teeth look beautiful it has also been shown to help fight bacterial infection & relieve pain from toothache. 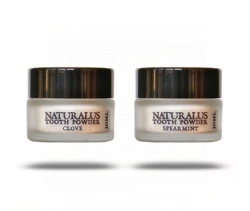 Works as a teeth whitener as well as the more important aspect of cleaning your teeth. Helping to scrap off the yellow and brown stains by penetrating the teeth's enamel and lightening the stains to give a much whiter appearance. Baking Soda also gives a polished effect (without scratching the tooth surface) and helps to fight bad breath (halitosis). Sage has great astringent, antibacterial properties, making it suitable for strengthening the gums, lessening bleeding gums, bringing relief from toothache & infection. As well as have a delightful taste and leaving a freshness to your breath it helps to whiten & clean your teeth while lessening the chance of infection. Smells divine, leaving your breath tasting and smelling fantastic, but it also helps to heal sore gums and it to can help with whitening your teeth. It's anti-inflammatory action helps to reduce gum inflammation, speed healing, lessen pain and help to eliminate as well as prevent bacterial infection & heal bleeding gums by strengthening the gum tissue itself. This is the one for those who hate brushing their teeth. The yummy taste reminding me of the old fashioned lollies "Smokers". Clove oil is known for it's anesthetic activity, relieving toothache as well as being a boon for very sensitive teeth & sore gums. As well as this it's antibacterial action helps to heal ulcers, clear infection lessening tooth decay. Eugenol within clove inhibits growth of nearly all disease causing bacteria while leaving beneficial bacteria intact. Documented as being used as early as the 3rd Century B.C. Subjects awaiting an audience with Chinese Emperors were required to chew cloves to fix bad breath. Ancient Hindu texts describe how the used clove oil in dentistry procedures. 1945 Medical Text for dentists list clove, spearmint and other essential oils as being therapeutically active essential oils to use. Hippocrates the Father of Medicine himself treated rotting teeth and gums with pills of clove oil. Bernard Schechter DDS said that "since the 19th Century the germ killing molecules in clove oil have functioned for root canal work and other more serious dentistry. Charcoal helps heal any infection by pulling/drawing on the toxins/poisons from the infection helping to relieve pain, addressing any inflammation in the gums, as well as helping to heal any abscesses. Salt is a fantastic healer, helping to bring relief to inflammation and toothaches. Salt works by drawing out water from the pathogens & dehydrates them helping to kill bacteria & other germs. This also helps to firm the gums keeping them healthy as well as removing plaque while whitening the teeth. Available in a 30 ml glass jar. 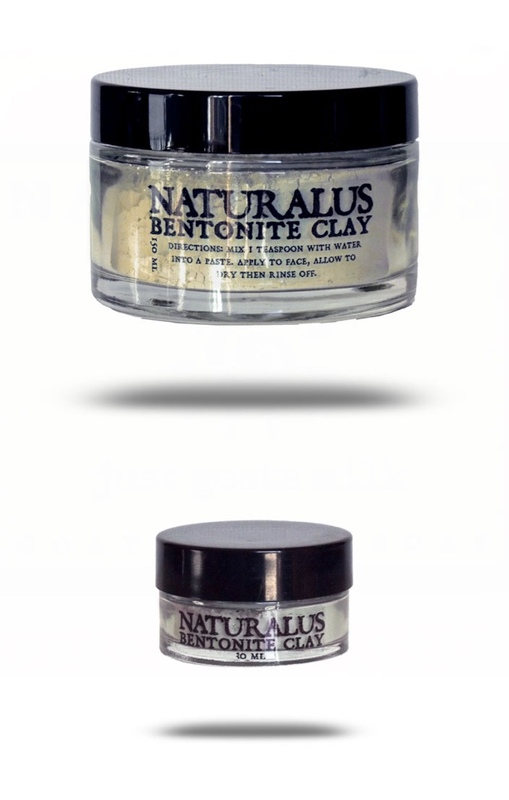 Superfine Bentonite Clay is very effective and a powerful healing clay. Clays have the ability to absorb excess oils, dirt & impurities from the body, while the essential minerals within the clay are released into the skin. They will gently exfoliate & help stimulate the circulation of blood and lymph, removing dead skin cells as well as tone & strengthen connective tissues to leave skin smooth, fresh & radiant. Helping to reduce blemishes - while maintaining a healthy appearance, soothe wounds, cuts & scrapes, relieve minor burns, insect bites & aching muscles. 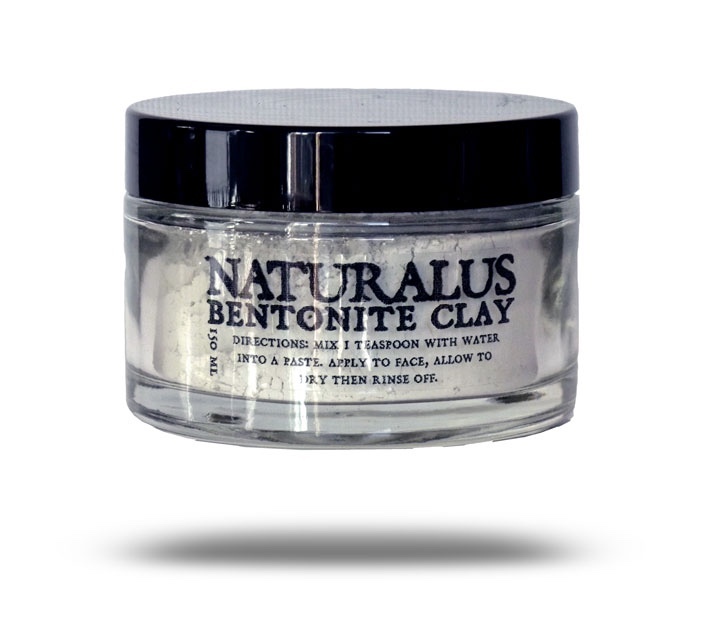 This is a very effective and a powerful healing clay. Used to treat both internal and external maladies. 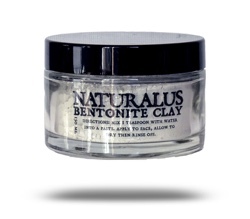 Bentonite is a swelling clay. When it becomes mixed with water it rapidly swells open like a highly porous sponge. From here the toxins are drawn into the sponge through electrical attraction, and once there, they are bound. 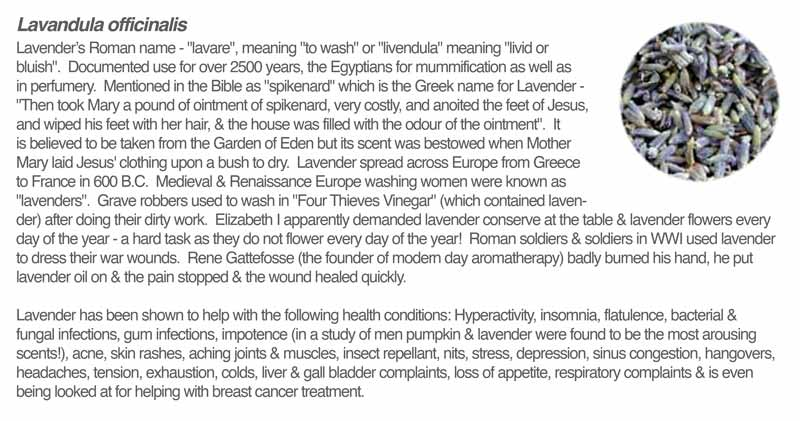 As well as cleansing and healing our skin it is used for many other ailments i.e. abscessed tooth, acid reflux, boils, candida, cold sores, constipation, lack lustre hair and skin. Mix equal parts clay and apple cider vinegar till a creamy paste, then apply to problem area, at least 1-2 cm thick. Let clay set on the body for approximately 45 minutes then rinse off to pull out any toxins. Mix equal parts warm water or apple cider vinegar and clay in to a thick paste. Add spring water to thin out slightly and apply a thin layer to your body. Apply either direct or between two pieces of gauze or similar material then cover with a hot damp cloth or wrap in cling film. Let clay dry for 20 minutes then rinse off with cool water. Follow with Naturalus Cocoa or Lavender Body Butter if needed. Mix all ingredients and apply to face. Let dry for 10 minutes. Rinse off with a warm washcloth. Mix Clay with enough milk to make a smooth spreadable paste. Add honey & thoroughly mix and apply to face. Leave to dry, at least 10 minutes. Rinse off with a warm washcloth. Mix all ingredients together. If mixture is very thick add some water till the right spreadable consistency. Apply to face, leave to dry, at least 10 minutes. Rinse off with a warm washcloth. Mix to a smooth paste. Apply to face, allow to dry at least 10 minutes. Rinse off with a warm facecloth. Mix the Oatmeal & Clay and add Milk till a smooth paste. Apply to face and rinse off with warm water after 20 minutes. Mix all ingredients together. If too thick add milk until the right consistency. Apply to face and rinse off with warm water after 20 minutes. Mix ingredients together. Add water if needed to make more spreadable. Apply to face and leave to dry. When rinsing off with warm water gently scrub to remove dead skin cells. Apply moisturiser afterwards. Mix the Aloe Vera, Rose E.O. and Rose Water together. Mix into the clay to form a paste. Apply to your face and neck. Allow to dry for about 30 minutes. Rinse off with warm water. Mix all ingredients together to form a paste. Apply to your face and neck. Allow to dry for about 30 minutes. Rinse off with warm water. Mix all ingredients together to form a paste. Apply to problem areas. Leave for at least 30 minutes. Rinse off with warm water. Mix all the ingredients to form a paste. Apply to face and neck. Leave for at least 30 minutes. Rinse off with warm water. Clay masks are very effective remedies. They absorb dirt, clean the hair and scalp, give volume to the hair and also have antiseptic properties. WARNING: Clay mask can make your hair very heavy and dry. So make sure you applied hair softening conditioner or balsam after procedure. Use clay mask no more then twice a week. The simplest way to make a clay mask is to mash it with water, green or chamomile (or any other herbal) tea. 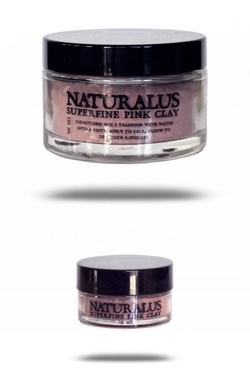 Mix some of the clay with liquid until a smooth paste Then rub it into the hair roots and along the length of your hair. Wash your head, with shampoo, after 20 – 30 minutes. To make your hair more shiny you can add 2 tablespoons of apple cider vinegar and an egg yolk. Mix all together and rub it into the hair roots and along the length of your hair. Wash your head with shampoo after 20 – 30 minutes. Add Clay to the Green Tea till you get a spreadable paste. Rub it into the hair roots and along the length of your hair. Wash your head with shampoo after 20 – 30 minutes. This mask will reduce redness and puffiness and green tea also serves as a mild astringent to reduce oil. Mix the Cucumber & Oatmeal together. Add Clay to get a spreadable mixture, add water if too thick or dry. Rub it into the hair roots and along the length of your hair. Wash your head with shampoo after 20 – 30 minutes. The oatmeal will reduce oil in the skin and the cucumber will soothe and moisturize along with the clay. A white clay rich in calcium, silica, zinc and magnesium used for oily, acne-prone, sensitive, normal and dry skin. 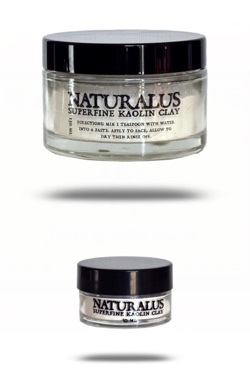 A white clay rich in calcium, silica, zinc and magnesium used for oily, acne-prone, sensitive, normal and dry skin. The mildest of all clays, helps stimulate circulation to the skin while gently exfoliating and cleansing it, bringing a smooth and healthy glow. Very balancing for normal, stressed, sensitive and mature skin. Very balancing for normal, stressed, sensitive and mature skin. It helps create a youthful appearance with ultimate hydration and skin firmness. It's hydrating properties help to refine delicate lines, moisturize and improve the overall texture of the skin. It can also be used to treat acne and other skin ailments, poor blood and lymph circulation and sun damaged skin. Even good for applying to nappy rash - you can add a few drops of calendula oil in the mix of clay and water before applying for an extra replenishing cleanse. Great for detoxification can be used to normalize oily skin, balance combination skin, and revitalize dry skin. Great for detoxification can be used to normalize oily skin, balance combination skin, and revitalize dry skin. It's rich in vitamins and minerals and has antiseptic healing properties that leave the skin feeling silky smooth. The minerals in the clay help to rebalance oil flow, to strengthen skin and it acts as an aid for repairing scars. Ideal for body wraps after pregnancy, where cellulite and stretch marks are of concern. For sensitive or pale skin mix 50/50 with Kaolin Clay, this way you get the good drawing effects but in a much softer and more hydrating way that can be handled by sensitive skin. Wonderful to use on all skins, especially sensitive skin. Wonderful to use on all skins, especially sensitive skin. Perfect to use to revitalize tired and neglected skin, restore a healthy glow, reviving, hydrating and cleansing, balancing oil secretion as well as being beneficial for rashes of unknown cause, eczema, psoriasis, ulcers, acne, and even nappy rash and cradle cap. Use alone with water, or mix with herbal tea infusions, oils (i.e. calendula, rose hip, castor), honey, &/or essential oils. Free PDF file full of inspiring recipes to use on your face, body or hair sent via email with every purchase of Naturalus Clays. Suitable for use with all skin types, particularly healing for sensitive, dehydrated, dry and mature skin. A stunning shade of Red, it is suitable for use with all skin types, particularly healing for sensitive, dehydrated, dry and mature skin. Can help with healing/improving broken capillaries, bags under eyes, muscle toning, restoring vitality to your skin, hydrating, cleansing, balancing oil secretion. It helps to draw out impurities and toxins, tightens pores, removes dead skin cells revealing a smoother fresher complexion. 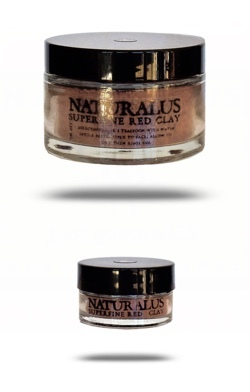 Red clay helps to create a youthful appearance, ultimate hydration and skin firmness, toning, firming and exfoliating its high mineral content rejuvenates and enhances your skin. 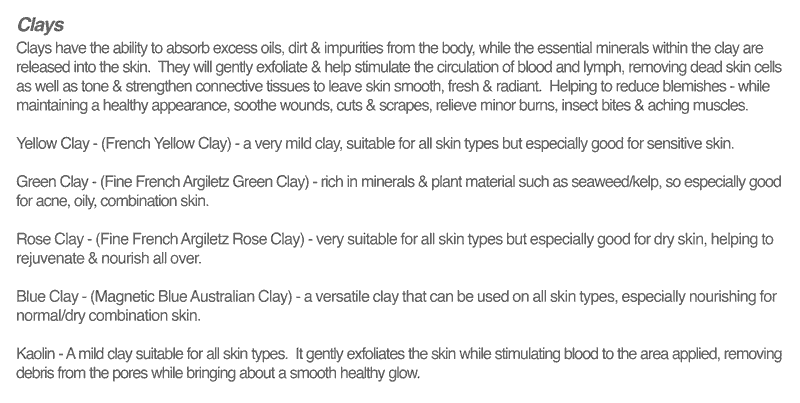 Caution should be exercised as coloured clays may stain skin so best to combine with another clay such as Kaolin, Bentonite, Yellow or Blue for best results. 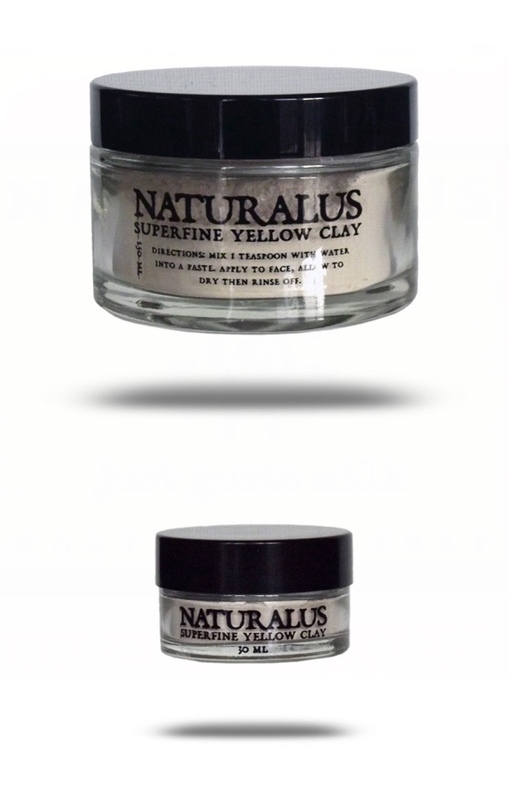 Choose 5 150ml Clays for a 20% discount. 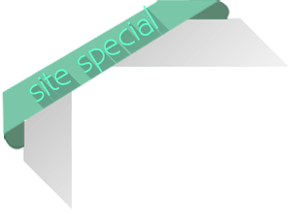 See individual Clays for more information.